Look - deep amber and creamy head, has the look of an important, robust beer. Smell - You get a hint of the smokiness, but mostly fresh malt and very subtle hops. Taste - Multi-layered, from the early anise form the angelica to a full flavor middle, followed by a long smokiness with a pleasing alcohol undertone. Feel - When cold, it is crips and clean, almost refreshing. Warmed to cellar temperature, you get a fuller mouth but it still belies the high ABV. Overall - With the smoked Icelandic barley and angelica, this Wee Heavy has taken more risks than your standard, off-the-shelf Scotch Ale. And it pays off in spades, deliciously. I will crave this. From the bottle, this Wee Heavy is a dark, hazed brown with a creamy beige head. Toasty, roasty, bready, and malty in the nose. Smooth on the palate with some viscosity and creaminess. The malts are sweet with brown sugar, toffee and roasty notes along with a subtle smokiness beneath it all from the addition of smoked Icelandic barley. Herbal, spice, wood, and earth suggestions from the addition of angelica root lend a distinct tonic and gin-like edge. This plays well off of the sweetness, smokiness, warming booziness, and peppery linger. A delicious Nordic twist on a classic Scottish-style. As reviewed in BeerAdvocate magazine #119 (December 2016). Einstök Ölgerð "Icelandic Wee Heavy"
Notes via stream of consciousness: Based on the Beer Advocate ratings I went ahead and bought a bottle of Einstöck Wee Heavy to give it a try. Pours a nice full head of frothy light tan atop a somewhat hazy dark mahogany brown body. Looking at the bottle it notes "SMOKED ICELANDIC BARLEY" and "ANGELICA ROOT" - interesting. The head has dropped to a creamy cap, and the glass is completely covered in a tattered veil of lace - nice. The aroma is fairly mild, displaying caramelish and softly chocolatey malt, a light smoke,and something that might be from the Angelica root - it's herbal and anise-like. I thought Angelica root was more like a celery, but what do I know? I've never even seen it, let alone tasted it. It's there in the flavor as well though... I'm not sure what to think about it. It's mild, and I guess interesting. I like it. The smoke remains mild. With each sip the lace now shows rings within a solid background. The caramel and subtle chocolate appear upfront with a little bit of toast, a tiny bit of fruitiness, and what I think is the Angelica root, and then the smokiness appears more towards the finish, and then lingers very gently with the licorice/herbal/almost-minty note becoming more prominent. It's not that bitter, but the smokiness and licorice note help to balance it. Points for uniqueness. Nicely balanced. nicely rounded, meaning that none of the components really stick out any further than the others. It's not sweet, although it should be a little bit sweetish for the style... and the malt does linger nicely in the finish. Medium leaning medium-light in body and quite smooth with a fine-bubbled, moderate carbonation. Really nice caramel component like you get from scorching the wort as you bring it over into the kettle. It really opens up as it warms, so I'd suggest enjoying it close to cellar temperature. One member of the FGBS Tasting Group recently bought a sixer of this & gifted a bottle to each person in attendance that evening. It is no wonder that I never seem to get ahead of The Bottle Backlog here at Chez Woody. At least, I am having fun trying. From the bottle: "Viking history in Scotland goes back more than a thousand years. Even our brew master studied in Edinburgh, where he carefully surveyed the local craft. 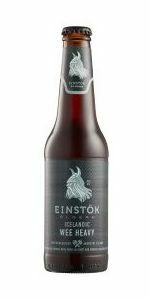 Now we return with an Icelandic Scotch Ale, brewed with locally farmed smoked barley and spiced with native Icelandic angelica – a fabled herb ancient Vikings used as currency. Surrender your taste buds. They have no choice but to be conquered. DREKKTU. SIGRADU. ENDURTAKU." Why, it's just a wee bottle of Wee Heavy! I shall Pop! the cap & give the wee one a heavy-handed pour. Well now, if I didn't get a pseudo-cascade out of that bit! It settled into three-plus fingers of dense, foamy, light-tan head with excellent retention. Klaatu barada nikto! Spa fon! Squa tront! Color was Dark Brown to Very Drk Brown (SRM = > 27, < 34), with cola highlights at the edges. Nose had a smoky sweetness, kind of like Sweet Lebanon Bologna, but that is an imprecise analogy since I also got notes of caramel and salt. Oh, man, this instantly made me hungry! Mouthfeel was medium-to-full, lightly carbonated so as to be dense in the mouth. I want to return to the idea of Sweet Lebanon Bologna as far as the taste is concerned. Seltzer's and S. Clyde Weaver are the best-known local brands, in case you want to order some for yourself. The meat has a sweet and salty aspect which is then smoked as part of the process. This beer would be a great accompaniment to it! Another hint is to spread either cream cheese or peanut butter on a slice, roll it up & eat it in combination. Back to the beer. It was smoky, but not so smoky as to be unbearable for some. I really have to wonder about that angelica and what it imparted here. Still, it was quite tasty and nowhere near as sweet and cloying as some (many?) in the style. Finish was semi-sweet, but held in check by the smokiness. Definitely a candidate for a Smoke 'Em If Yinz Got 'Em horizontal tasting! This is a really nice beer. Pretty unique, too. The malt character is full but not heavy, and pretty refined overall- lots of dark bread, caramel, nuts and dates come on in gentle waves. The counterpoint is a rustic floral/herbal character in the aroma, as well as a slight mellow smoke on the finish. And it's pretty easy to take down a few in a row, so that's a nice bonus. I poured the beer into a pint glass. It is a dark brown. The head is cream colored. I can smell something. I don't know what it is, but I like it. The beer has an interesting mix of flavors. 11.2 oz (330 mL) undated bottle from Tennessee. Served in a goblet. Clear, dark, lightly hazy red-brown body with a short head, most of which quickly dissipates. Aroma – Sweet and malty with a clear hint of toffee. Flavor – lightly sweet with caramel malt and just a trace of smoke. Feel – medium body and near medium, soft carbonation. Smooth. Pours murky, reddish-brown in color with 1/4 inch head. Taste is peat, heather, lavender, brown sugar, and smoke. Medium bodied, low carbonation, and sweet. Really tasty for a style that I do not get often. Nice and clean flavors. Really impressed. Dark brown in color with amber highlights. Clear, and white head. Malty caramel aroma with a touch of smoke. Similar flavor - toffee, but with some herbal earthiness too. Not too sweet. Medium bodied.